Andhra Pradesh DGP J.V. 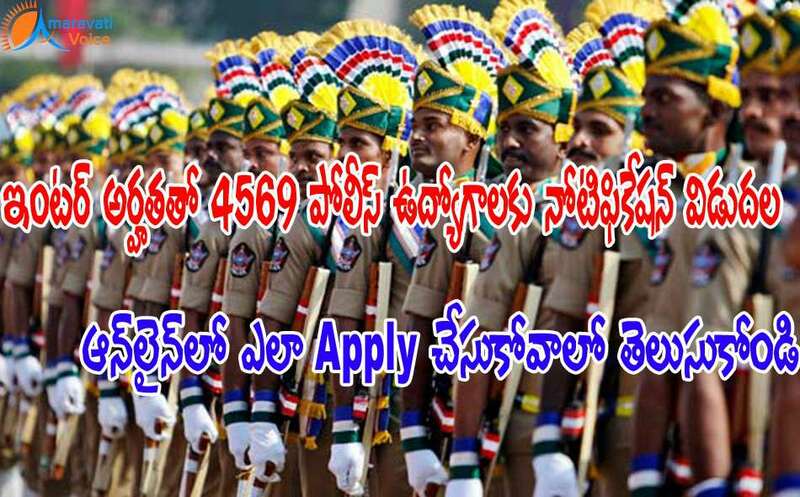 Ramudu released a notification for filling 4,569 posts in police department. The Preliminary Written Test will be held on 16.10.2016(SUNDAY) from 10.00 AM to 01.00 PM. (3 hours). The registered candidates may download their Hall Ticket from the website 10 days before the date of Preliminary Written Test. The candidate must hold, as on 1st July, 2016, Intermediate or its equivalent examination recognised by the State Government. In the case of a candidate belonging to Scheduled Castes or Scheduled Tribes, as on 1st July, 2016, he/she must have passed SSC or its equivalent examination recognised by the State Government and should have studied Intermediate and appeared for the Intermediate Examinations in both the 1st year and 2nd year. Must have attained the age of 18 years and must not have attained the age of 30 years as on 1st July, 2016 i.e., must have been born not earlier than 2nd July, 1986 and not later than 1st July, 1998.
b)Chest: Must not be less than 86.3 cms round the chest on full inspiration with a minimum expansion of 5 cms.